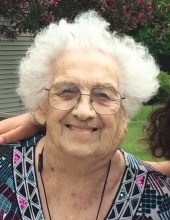 Hilda B. Heilgendorf, age 95 years, passed away early Saturday, July 9, 2016 at Aurora Medical Center in Grafton. Hilda was born January 27, 1921 in Saukville, the daughter of Carl and Augusta (nee Lubhan) Parnitzke. On April 18, 1942, she was united in marriage with Hilbert Heilgendorf in Fredonia. Hilda and Hilbert ran the Heilgendorf family dairy farm in Saukville until 1985, and were long time members of St. John Lutheran Church in Fredonia where Hilda was part of the Ruth Guild. For 25 years, she served as a 4-H leader. She enjoyed showing paintings and flowers at the fair, making and decorating cakes, watercolor painting and tending to her flower and vegetable gardens. Hilda is survived by her children: Larry (Joni) Heilgendorf of LaGrange, KY, Rose (Dennis) Bottesi of Manitowoc, Bryan Heilgendorf of Port Washington and Dawn Heilgendorf of Port Washington. She is further survived by her grandchildren: Jennifer Bottesi, Kevin Bottesi, Brandi McDonald, Kurt Heilgendorf and Jonathan Heilgendorf, great-grandchildren: Soleil, Lucian, Sevryn and Isis Bottesi and Krista, Lily and James McDonald, brother William Parnitzke of Waubeka, sisters Ida Koehler of Shawano and Anna Schmidt of Mayville, many nieces and nephews, other relatives and friends. She is preceded by her husband Hilbert and her brother Robert Parnitzke. Funeral Services will be held at 12 noon on Thursday, July 14, 2016 at St. John Lutheran Church, 824 Fredonia Ave. in Fredonia. The family will receive visitors at the church on Thursday from 10AM-12 noon. Hilda will be laid to rest at St. John Lutheran Cemetery. In lieu of flowers, memorials are suggested to St. John Lutheran Church. The Eernisse Funeral Home, Port Washington is honored to be assisting the family with arrangements. To send flowers or a remembrance gift to the family of Hilda B. Heilgendorf, please visit our Tribute Store. "Email Address" would like to share the life celebration of Hilda B. Heilgendorf. Click on the "link" to go to share a favorite memory or leave a condolence message for the family.